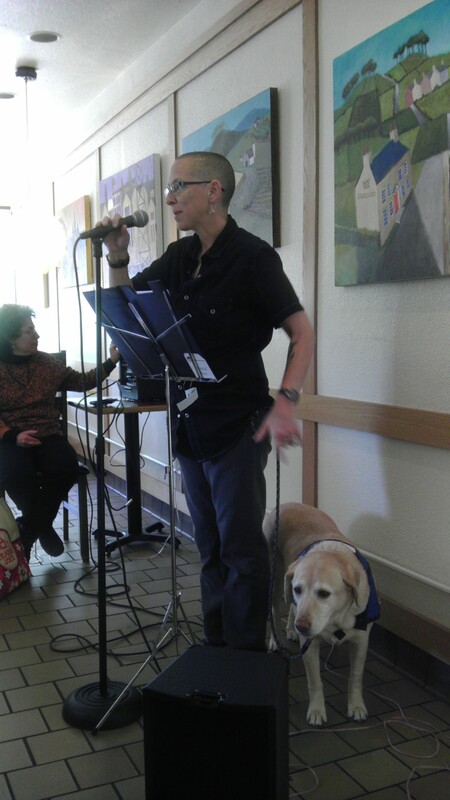 Redwood Writers member Michelle Wing entertained us as a Featured Reader for the RW Open Mic yesterday at SoCo Coffee in Santa Rosa. Her poetry enticed us to picture the images and appreciate the rhythms and moods of her work as we celebrate April as National Poetry Month. Thank you, Michelle! 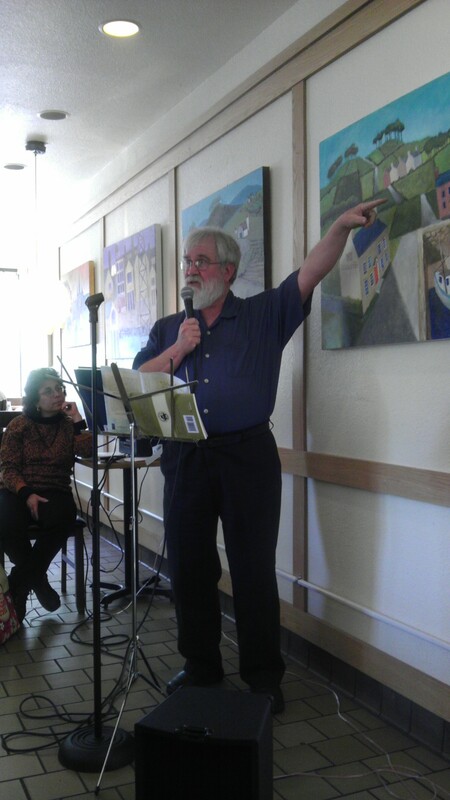 Gil Mansergh, a past president of Redwood Writers, was one of our two Featured Readers on Saturday, April 27, at the RW Open Mic at SoCo Coffee. Here he utilized the painting behind him to help us visualize the town of Gloucester, MA, setting of his novel THE MARVELOUS JOURNALS OF MISS VIRGINIA PETTINGILL. You may enjoy Gil’s literary radio show on the 1st Wed. of each month at 7 pm on KRCB. This entry was posted in authors, California Writers Club, great stories, poets, Sonoma County, writing and tagged California Writers Club, poetry, writers. Bookmark the permalink. Thanks for posting this about Redwood Writers reading at SoCo Coffee in Santa Rosa. I so wanted to hear Michelle and Gil read. Too many things to do this spring. You’re welcome, Deborah! Hope you can make our next RW Open Mic which is Sat. May 25 at SoCo Coffee. We’d love to have you come read again, or just listen.